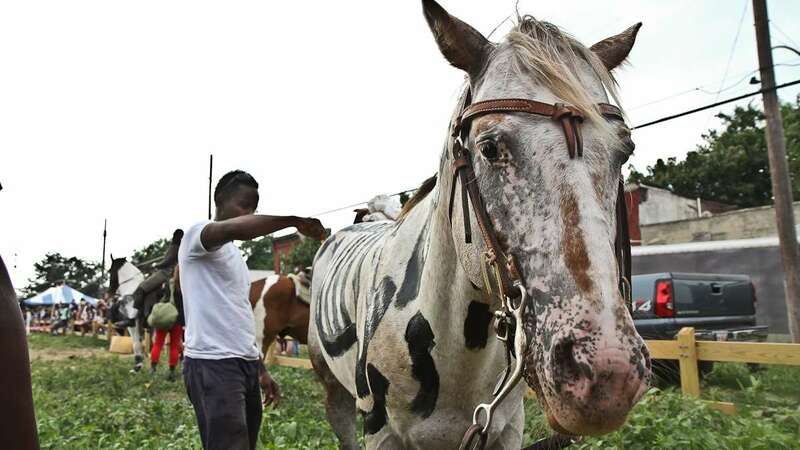 On a recent Sunday afternoon, Emmanuel Taati is painting Montana, a white horse. With thick, black strokes, he outlines Montana’s ribs. 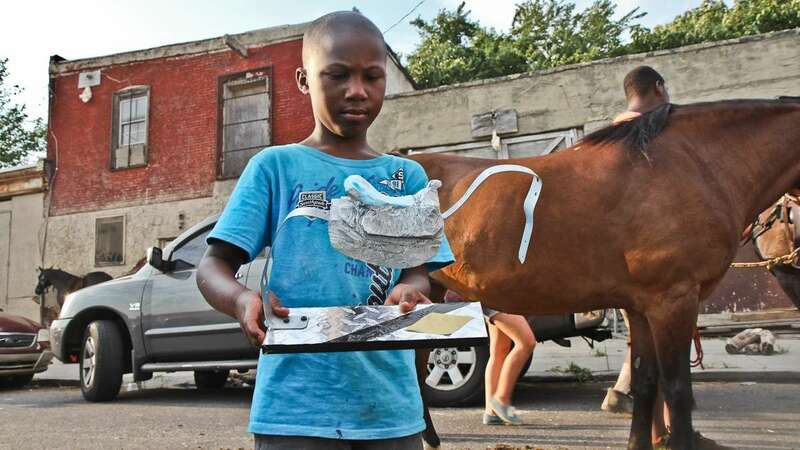 “It’s messy because he’s ticklish,” said Taati, who is a participating in the Horse Tuning Expo, a first-time event designed for North Philadelphia riders and artists to team up and give the community a grand showcase of equestrian skill. As Taati rushes to finish, Montana’s rider mounts. 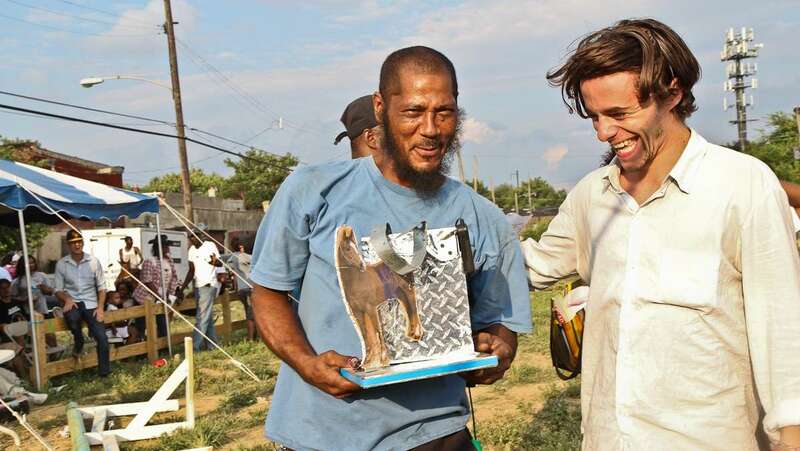 They trot into the roped-off center section of the block-long vacant lot on Fletcher Street and present for three minutes as part of a judged freestyle competition. After Montana, Rosie Gal, a chestnut horse adorned in silk flowers, gallops into the ring to perform for about a hundred attendees. 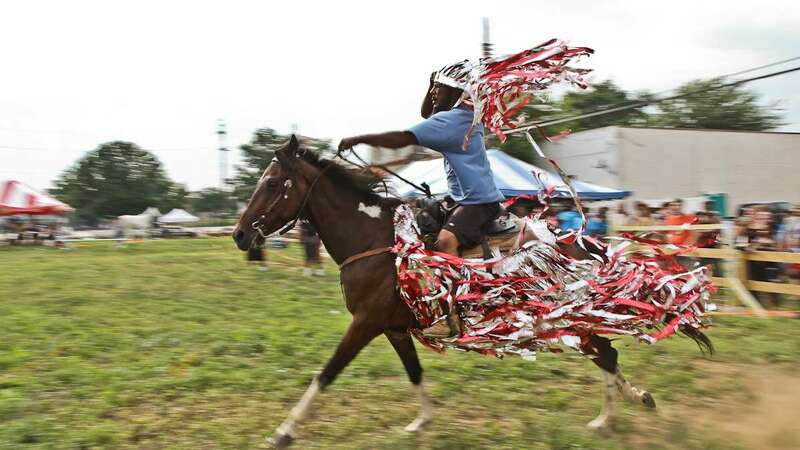 The next rider is Leroy Jordan, who thunders into the lot in a flash of silver and red accompanied by a drum band. Jordan worked with artists Max Lussenhop and Billy Dufala to create the costume and presentation. Jordan’s horse, Rosie, literally dances through the ring and the audience hollers approval. 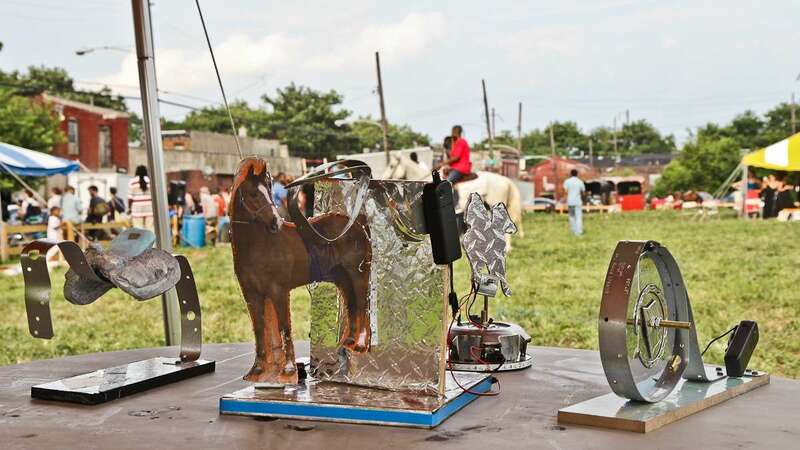 Later on, Jordan and Lussenhop accept the first-place award, a sculpture made by French filmmaker Mohamed Bourouissa, who arranged the event and plans to include it in his hour-long experimental film. Production teams set up along the sidelines capture the action, which includes navigation of an obstacle course, a freestyle round and pony tag. A drone outfitted with a Go-Pro camera buzzes overhead. 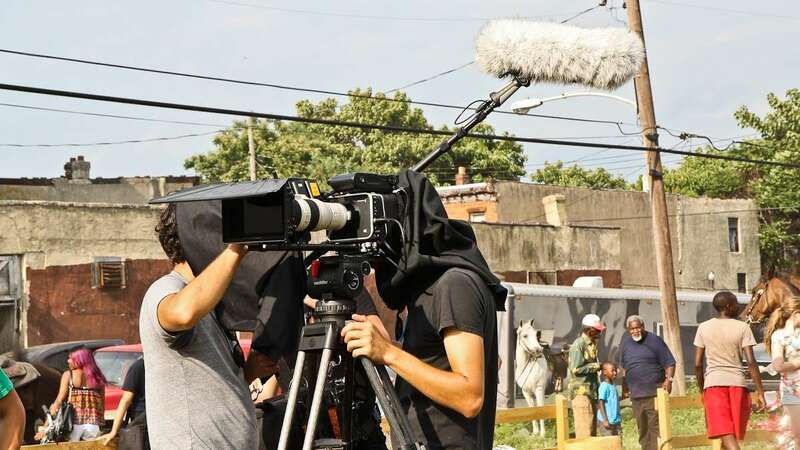 Gino Varisano and Zac Rubino, local freelance cameramen, have a difficult time explaining what the finished film will be, but say it will feature the Horse Tuning Expo footage. Bourouissa has also been shooting scenes with actors, they said. 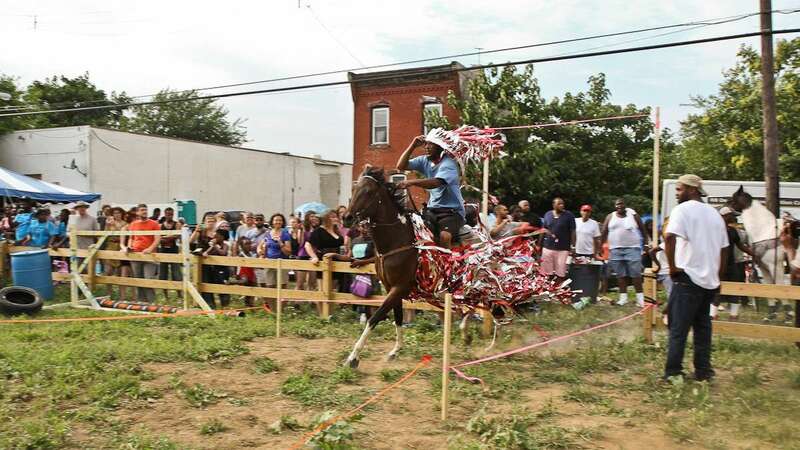 Many of the riders are members of the Fletcher Street Urban Riding Club, which aims to use riding and horse care to mentor children and young adults. 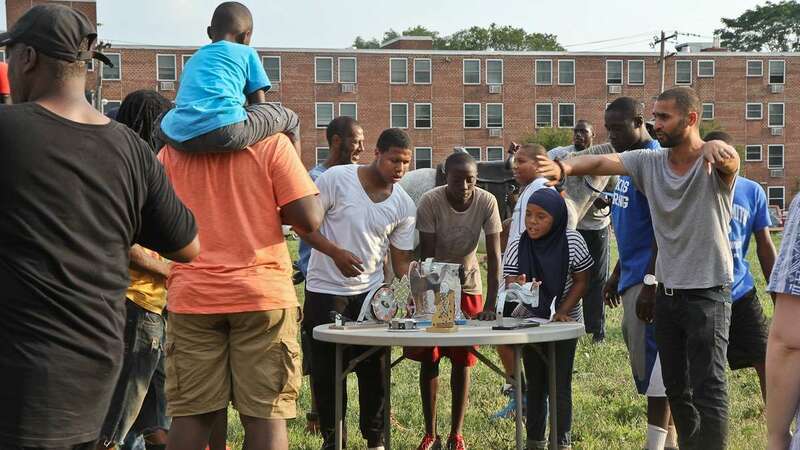 The club offers stability for those living in the impoverished Strawberry Mansion neighborhood. Jesse Engaard is the assistant director of Bourouissa’s film. With his arms folded, he intently watches the from the shaded judging area. 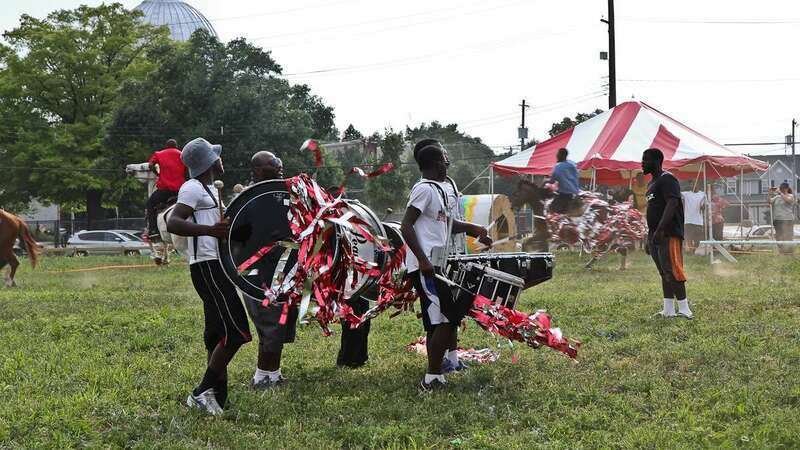 Engaard, a Philadelphia resident for 14 years, worked to set up the event. 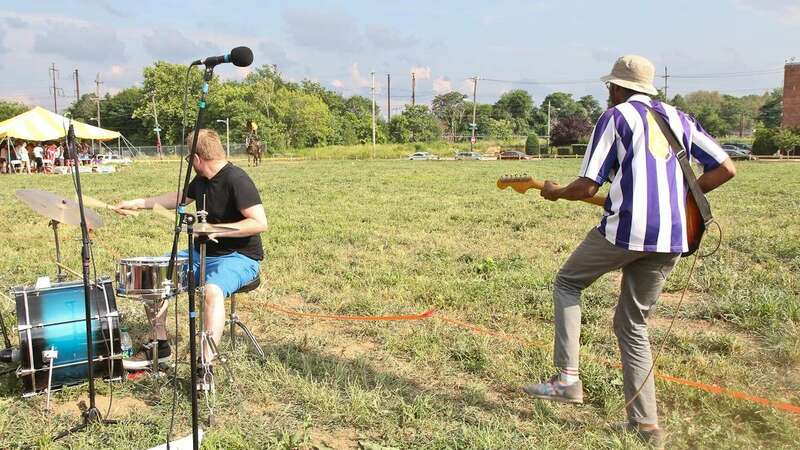 He and Corrine Castel, the film’s producer, met with the Philadelphia Redevelopment Authority (PRA) to obtain permission to use the vacant lot to host and film the event. In March of 2007, the city tore down the riding club’s corrals and stables and built a fence around the lot, known as Fletcher Field. “The PRA (and by extension the taxpayers) isn’t willing to accept the liability associated with children, adults, and the horses on the property. 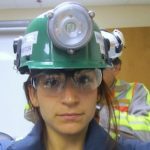 PRA is open to discussions regarding a license agreement, pending of course Council approval and if the Club provides evidence of insurance,” said PRA spokesperson Jamila Davis. Davis and Engaard both hope that this one-time agreement will lead to permanent licensing for the club. Davis said at this time the PRA has not found a single point of contact to discuss a potential agreement. “It is the PRA’s hope that this event is the start of building a relationship between the PRA and the club,” she added. 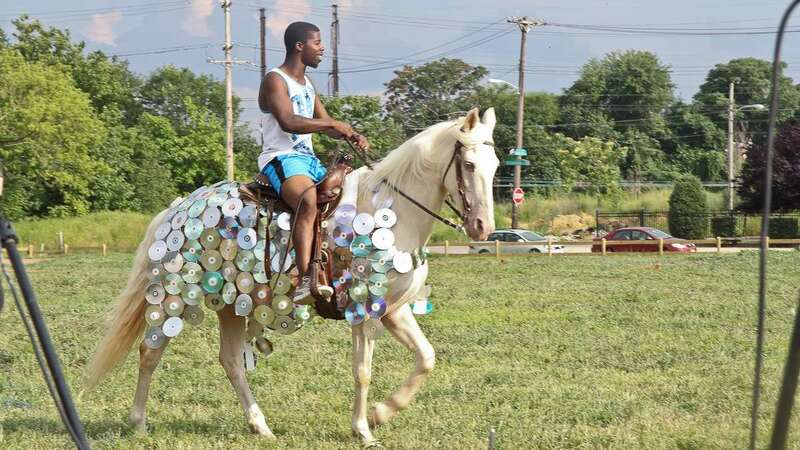 Caleb Carter’s horse, Trigger, wore a costume made from CDs and DVDs to resemble armor. The 22-year-old said he’s been riding since he was 3 and that taking care of horses and learning to ride has taught him responsibility and patience. He’s also developed respect and admiration for animals. He enjoys taking care of them and especially the competition and fun of the Horse Tuning Expo. 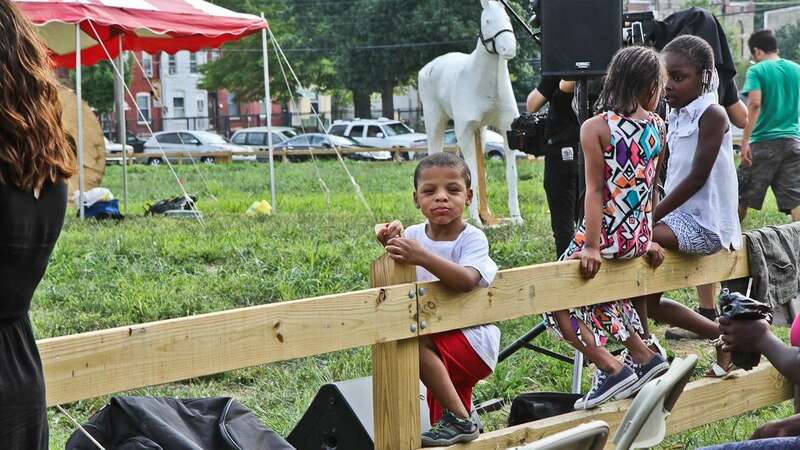 “The block is filled with people,” said Carter, “It hasn’t been like this in a long time.” The Fletcher Street Urban Riding Club is currently raising funds to buy another vacant lot on Fletcher Street.